I have prayed for him and will continue to do so, keep us updated please. Just said a prayer for him and your family Freddie. It's a good thing that they are doing what they have to now before a heart attack. Please keep us posted on his progress. Well I'm glad he was convinced to seek help. Praying. I'll sure pray for him, Freddie. Maybe it won't be bad enough to require surgery. Praying for God's healing for your dad. That's scary and it's good that he went in when he did. Now they can help him before anything goes wrong. I sure will keep him in my prayers Freddie and let us know how he's doing. Mom and I spent all day at the hospital. The procedure was supposed to take place at 11:30 A.M. There were a couple of cardiac emergencies so my dad had to wait for his turn as the emergencies take precedence. He finally got into the O.R. at 4:30 in the afternoon. The test showed blockage in several smaller arteries that could be treated with medicine. One slightly larger artery had 95% blockage so a stint was placed,another has 60 percent blockage but the doctor said to wait and see if meds can take care of that one, but if he experiences any more chest pain he will be back for another procedure. I was talking to my mom while we were in the waiting area and apparently my dad has been having pains for several MONTHS but refused to see the doctor. Well needless to say this was an eye opener for him. I stayed at the hospital until they got him back in his room for the night and could see in his face that he was feeling better. When his dinner arrived he ate it up like he was starving. Thank you for the prayers and well wishes. He is resting now and should be coming home tomorrow. Glad to hear that all went well. Wow dude, he looks like the King in my book! Glad to see He's improved. I sure hope he will listen to them now and take his meds. It's amazing to me how heart procedures have gotten to the point that they are almost in and out types of things. When my dad had open heart surgery a couple times back in the 60's and he was in the hospital for over two weeks each time. Freddie, you are so lucky! You're Dad is Santa Claus! But seriously, I'm glad that things turned out so well. He still has to be very careful with that stint for a while. I remember my orders. No lifting, no bending over, get plenty of rest. I didn't realize that, until they settle in, those stints can move! It's very important that he follow doctor's orders! My stints have been in a year now. They really made such a difference. I'm also diabetic like your Dad. Keep after him to watch his diet. That can make all the difference in his recovery. I'm happy to hear that your dad didn't need more extensive surgery and that he is doing well. I hope that this scare will convince him to follow doctors orders and to see the doctor on a regular basis so he will be around for a long time. Amazing what the doctors can do. Hope he continues to do well on the meds. Dad came home yesterday afternoon. He is feeling better and we are going to visit him today. When I said he is Santa I really meant it. He has the suit and everything. He is the "official" Santa Claus in the town he lives in,meaning every Christmas he rides into town on the back of a firetruck and lights the community tree. 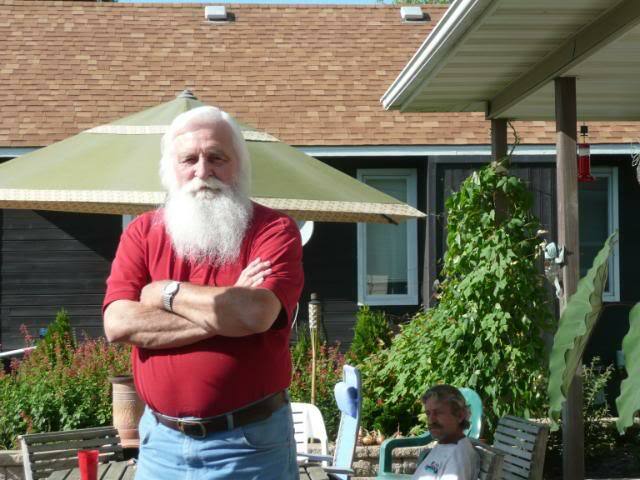 He started as a mall Santa 5 or 6 years ago. Now he does private parties and makes appearances at restaurants and hospitals. He even has a modeling portfolio and has been contacted by the Ford Modeling Agency. He has done several television appearances as Santa and a few print ads too. My mom dresses as Mrs. Claus and has done appearances with him. I'll try and post a picture of Mr. and Mrs. Santa Claus in the next few days. So Freddie, does the costume and wigs get handed down to you to carry on the tradition?